The tall iron arch at the foot of the high hill signals something special. Still drivers speeding or snaking by, intent on making their way between Morris Plains, Parsippany and Denville, rarely make the turn. Overshadowed by traffic on Route 53, overpowered by adjacent housing tracts, industrial parks, and strip malls, the arch’s invitation is bold, but easy to ignore. 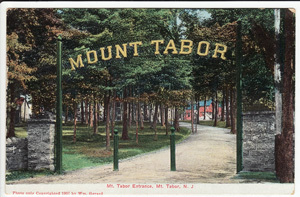 It announces a name in bright letters: Mount Tabor. But for many passersby what lies beyond remains a mystery. As it turns out, there’s a reward for the curious. Above that gate, perched on a hillside, a tiny treasure hides in plain sight. 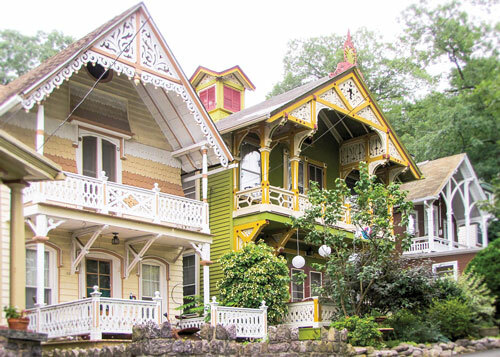 Mount Tabor, named for a biblical mountain near the Sea of Galilee, is an architectural adventure—full of Victorian cottages sporting period paints and gingerbread, with a colorful history to match. It’s as if a sliver of vintage Cape May somehow landed in busy, suburban Morris County. Though only about 350 families strong, the community, which began as a Methodist summer tent camp just after the Civil War, is long on personality and welcoming spirit. This is a world where people sit on porches so close they can shake hands with the neighbor next door; walk to the library for a book; pick up daily mail at the post office (no home delivery) and live in houses decked out in crazy quilt combinations of salmon, mint, raspberry, olive, purple, teal, and ochre. Tented platforms are set up for the annual House Tour. But by 1889, secularization of the community seemed in sight. “Few prominent clergy men have preached here, and the crowds that have attended have come more with the idea of a picnic in mind than with any care for their spiritual welfare,” was how The New York Times described the Mount Tabor Methodist encampment that year. 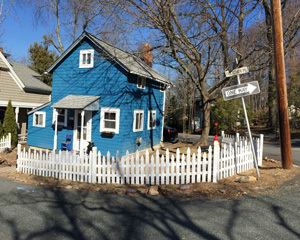 On single tent-sized house survives at 31 Fletcher Place. 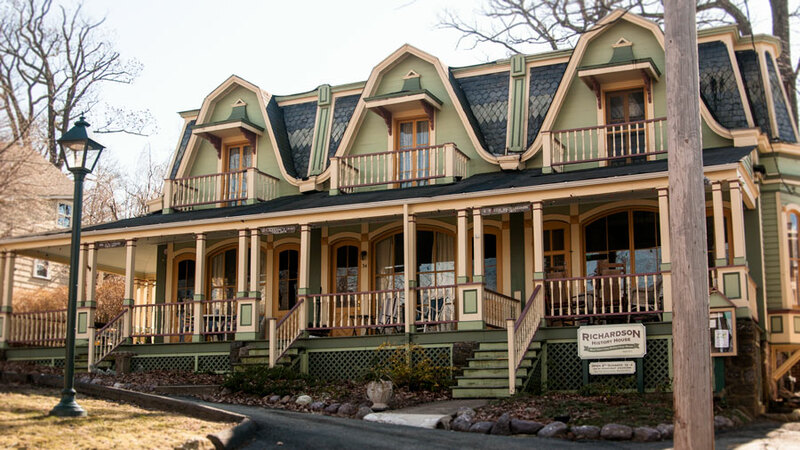 Despite its history and concentration of Victorian buildings, not until 2015 did the Mount Tabor historic district land on the New Jersey and National Register of Historic Places. A walking tour could begin with a train ride. Trains have been running to the Mount Tabor platform (first the Delaware Lackawanna and Western) since 1881 and still do. According to the blog Transitism, the station is one of the least used in New Jersey, with roughly 34 “passenger boardings” each day. For those who prefer to go by car, parking at the New Jersey Transit lot is restricted during the week, but free and open to the public on Saturdays and Sundays (parking in Mount Tabor itself is limited). 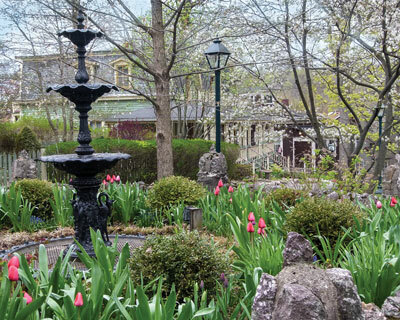 It’s a short walk from the tracks across busy Route 53 to what townspeople call “The Hill.” Enter through the welcoming iron arch, flanked by glacial puddingstone columns and walls. A hike up a grassy tree shaded knoll leads to quiet Simpson Avenue, which cuts across town. 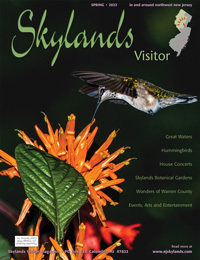 Just below, a gazebo invites you to sit and take in the hilltop view to the west. Above stands a colorful cluster of barn-sized town buildings - the Old Firehouse with its bell (which announced fires until a siren replaced it in 1923), original Tabernacle (1869), and octagonal Tabernacle (1885), decked out in board and batten siding in bold green and red paint. Both Tabernacles (the earlier one relocated in 1885 to make room for the newer larger one) served as gathering spots for the faithful, framing preachers’ stands. Today, the Tabernacle houses community events as well as a music world fixture: the long-running At The Tabernacle Concert Series. Promoters of the folk/rock series tout the venue’s exceptional acoustics with an appreciative quote from the legendary John Sebastian: “This building plays like a fine guitar.” The building once held as many as 1,200 worshipers, but At The Tabernacle caps occupancy at 350. The Tabernacle sits at the entrance to Trinity Park, overlooking the firehouse. On the high side of the Tabernacle lies the heart of the historic district: pretty, pedestrian-only Trinity Park, approached by narrow walking paths from all sides. A grass circle lined with gingerbread cottages, it’s a world in miniature. Yet thousands of worshippers are said to have gathered here on benches and leaning over upstairs and downstairs porch rails to listen to camp meeting services. 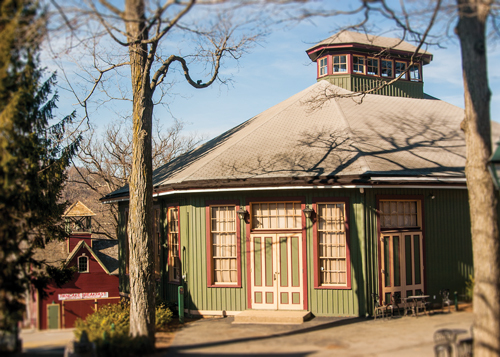 The Lilliputian octagonal public library, also known as the Ebenezer Pavilion, was once an open air prayer space. 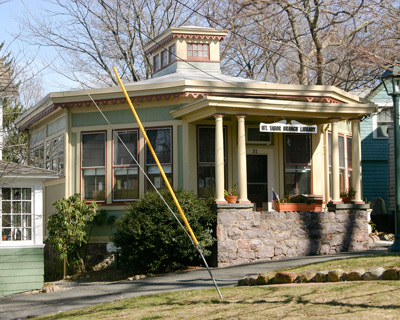 Enclosed for use as a community library in 1901, it now ranks as the smallest branch of the Parsippany Troy Hills library system. The Richardson family were summer residents, occupying the downhill third of a triple cottage constructed on original tent lots in 1873. Owned continuously by successive generations of that same family, their home was bequeathed to the Historical Society in 2007 by descendant Evelyn Blackford Clark, who had lived there since 1948. 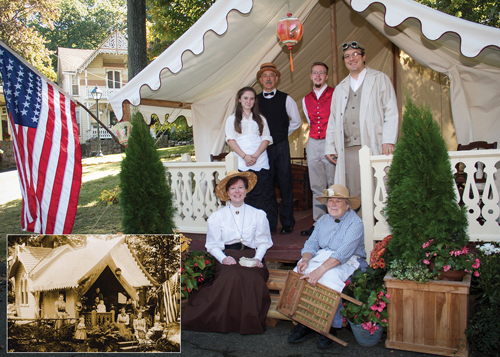 The Society restored it as a “Camp Meeting Cottage Museum,” filling it with Victorian furniture, a Chinese lantern—popular in the day and used to decorate and illuminate tents—photos, Camp Meeting posters and memorabilia. Once linoleum and sheet rock were removed, original features emerged, including stenciled interior paint motifs, pine floors and bead board. The double front doors leading to the porch and opening to “The Circle” mimic flaps of the tent that preceded the cottage. Open the second Sunday of each month from 12 - 4 p.m. or by appointment, the house also contains a shop stocked with books and Mount Tabor mementos and gifts. Nearby stands the Bethel, once the “Children’s Pavilion,” another octagonal structure that began as an open prayer space. The site of daily 4 to 5 p.m. children’s services during Camp Meeting days, it remains a community gathering place, which Mount Tabor families can reserve for special events (since most homes are small, residents sometimes turn to larger common spaces for family reunions). Walking uphill from “The Circle” takes you past a cast iron fountain (a replica of the 1875 original) then up the “Golden Stairs” (thought to refer to their heavenward orientation) to a higher elevation and St. James Park, home to a colossal stone water tower. Beyond, crossing St. John’s Avenue to Ridgewood Avenue, long views open up over the Mount Tabor Country Club golf course. The clubhouse, built in 1911, was once a center for community athletic activities. Be sure to wander on your way back down. Nearly every block near the town’s central axis sports a proudly restored Victorian or two, along with a fixer upper, mid-century interloper or slightly crumbling relic. While wandering, be assured: Mount Tabor prides itself on a neighborly atmosphere. “You wave to your neighbor when you drive by and they wave back,” says Jeff Dickerson, whose family pre-dates the name “Mount Tabor,” having sold its hillside farm to the Camp Meeting Association more than a century ago. “Everybody gets excited about the architecture and the history,” he adds. “But for me it’s about the neighbors.” The nineteenth century grocery business his forebears established lives on: the family owns the shopping center opposite the town’s entrance, and operates a supermarket there. After nearly 123 years in business at Mount Tabor’s base, selling groceries to Taborites, a neighborly atmosphere prevails. “We know our customers by name,” Dickerson says. Many families live in Mount Tabor for generations. Betsy Pauli, whose family moved to town in the early 1940s, has not one but three daughters living in Mount Tabor; one right next door, in a house that used to belong to her grandparents. That side of the community is on display at the annual House Tour every September (this year on September 24th) and during Mount Tabor Children’s Day, a summer reunion for all ages, when the community crowns a young king and queen and brings everyone together for a parade, games, and music, honoring a tradition going back nearly 150 years. In a nod to the past, those who choose to live in Mount Tabor encounter an unusual twist. While the camp meetings are history, aspects of Mount Tabor life are still run by the Camp Meeting Association or “CMA” which functions as a homeowners association, caring for the historic common buildings and parks and administering many aspects of the community. 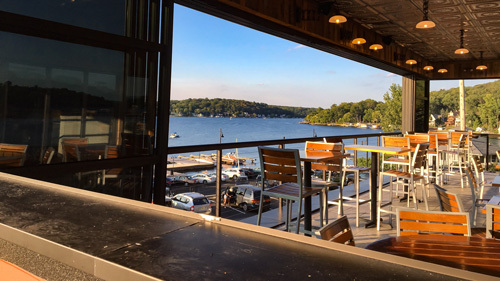 Though the town, once a municipality in its own right, became part of Parsippany Troy Hills in 1980, the CMA continues to own Mount Tabor ‘s property, leasing the land to homeowners, who pay annual fees.